For nearly a century, prominent Americans have matched skills on our fairways. Our three 18-hole championship courses, The Old White, The Greenbrier and The Meadows, are more than enough reason to lure golf aficionados to White Sulphur Springs. The spacious, well-groomed practice range immediately adjacent to the Golf Clubhouse offers realistic target greens, as well as a large putting/chipping area. Golfers who have played at The Greenbrier include Arnold Palmer, Jack Nicklaus, Ben Hogan, President Dwight D. Eisenhower, Nick Faldo and Tom Watson, to name a few. 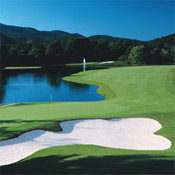 Each course begins and ends at The Golf Club and offers unique challenges and breathtaking views of the surrounding Allegheny Mountains.